Technology makes the world go around, and with an Associate Degree of Applied Information Technology from La Trobe University, a whole world of career opportunities will be available to you. Throughout this online course, you’ll complete numerous IT industry Vendor Certifications and develop a sound base of information technology skills and knowledge. From database and network engineering fundamentals to programming, project management and app development, you’ll learn everything you need to pursue a challenging and fulfilling IT career. When you study with La Trobe, you can achieve your qualification in just two full-time years of study. By enrolling in the Bachelor of Applied Information Technology, you can graduate after two years with an Associate Degree and the industry-certified skills you need to land a great position. So if you’re ready to make the commitment to your IT career, why not enquire about this course today? 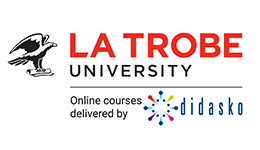 Upon successful completion of this course you will receive a Associate Degree of Applied Information Technology from La Trobe University. Students are able to exit the Bachelor of Applied Information Technology after successfully completing two years of study in order to obtain the Associate Degree. Graduates are then able to pursue a range of IT roles with an expected income of $60K–$80K+.